A HAPPY AND HOPEFULLY PROSPEROUS New Year to all you environmentally aware investors. �If the Gambling Greenie’s experience is anything to go by, you are going to need more than hope. It is almost exactly eight years since the Gambler started his portfolio �and so far he has lost �half his money. �Tut, tut. �And again I say unto you, Tut! �Stronger language is probably justified, but a couple of tuts will do. The moral of the story is that when gambling with the tiddlers and triers in the stock market, you need to keep your eye on what is happening to your beloved investments on a fairly regular basis. � Set-and-forget may be a fine strategy if you are a long term holder of shares �in a handful of major, well established companies, or in a fund that simply tracks the index. � �Companies at the cutting edge of technology or on the controversial side of politics are something else. Greenrock, for instance, bought when it was a geothermal hopeful, lost all hope and a lot of money but was reborn as BLACK ROCK MINING (BKT). �Black Rock has just signed its fourth offtake agreement for what looks like becoming a major graphite mine in Tanzania. When he bought the SEA FARMS GROUP��(ASX code SFG) it was known as CO2, whose business was planting native trees and selling carbon offsets to the likes of Qantas. �It still does, but while the federal government was promoting coal and resisting any attempt to put a price on carbon, it was a tough gig, so it decided to diversify into prawn farming. Since then Sea Farms has become a major multi-million dollar agribusiness, with ambitions to become a really major player in prawn farming. �In July last year it hived off the tree planting as a separate private company, and gave it to its shareholders in the form of unlisted shares in CO2. �Prawn fishing can be pretty destructive, so by taking some of the pressure off the wild stocks, Seas Farms might be considered a�“green” company, �but the Gambler will be happy to sell them when, and if, he shows a profit. He will keep the CO2 shares, partly because as unlisted investments, they would be very hard to sell. �Who knows, they may pay dividends one day. BLUGASS�(BLG)�is a research company which has developed what it believes is a better way of manufacturing energy-saving lighting, and it recently signed a collaboration agreement with the AIXTRON semi-conductor manufacturer. �That might lead to Blueglass’s research being commercialised at long last, but the Gambler has decided not to wait but to sell while he is still showing a slight profit. �They reached a peak of 53c in April last year, at which point he had tripled his money, but he wasn’t watching. �Deep sigh. Lesson learned. Last August, it sold 50 per cent of the only profitable part of its business, the supply of raw materials to other solar cell companies, to its own production manager, Dr Yanek Hebting. That must have reduced what little cash flow it had, and would have made the hunt for more investment funds even more difficult. It could still be rescued�— it is in administration, not yet liquidation. �In November, New Moonie Petroleum, which is establishing a food, water and infrastructure fund in Australia, agreed to take over a $2.4 mln convertible note which Greatcell issued in 2017, and there were hopes that New Moonie would then provide up to $15 mln over three months to ensure that Greatcell’s Major Area Demonstration�prototype project was fully funded. (It paid $4 mln to buy 18.2 mln GSL shares at 22c each in November.) 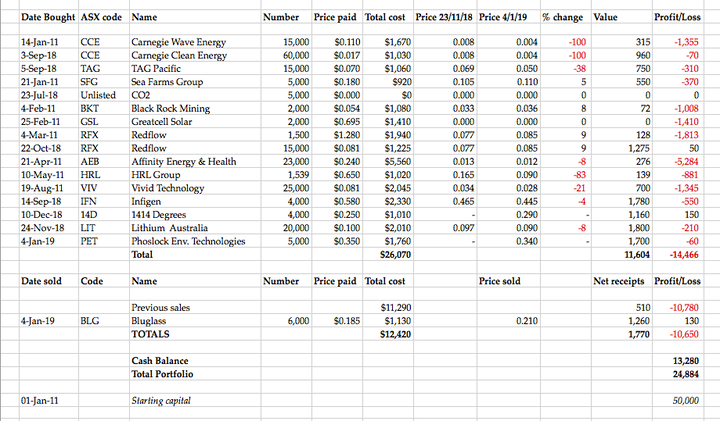 Moreover, the Australian Renewable Energy Agency (ARENA) has put $575,000 of taxpayers’ money into Greatcell so far and had agreed to pay a further $5.425 mln, depending on the progress of the demonstration project. �Greatcell’s shares remain suspended, so the Gambler can only wait and hope. At least one green company has been going gangbusters for the past couple of years. �Phoslock Water Solutions began humbly enough some 15 years ago, floating about on a few dams and lakes, neutralising the phosphates that feed algal blooms. It has since become PHOSLOCK ENVIRONMENTAL TECHNOLOGIES (PET), moved into the Chinese market in a big way, and has seen its share price double each year for the past three years. It has expanded its activities to include environmental materials and engineering. �Revenues are expected to increse 60 per cent to $27 - $30 mln in the current financial year, boosting net profit before tax to $7 to $10 mln. It has no debt, and around $8 mln in cash. Nevertheless the Gambler has decided not to wait for the price to drop further, and has splashed out $1,760 for 5,000 PETs. His caution earlier in bidding what seemed like a cheekily low price for shares in the fledging South Australian energy storage company 1414 DEGREES (14D) �has paid off. �In the great December stock market selloff, the shares dipped to his 25c limit and he duly �picked up 4,000 shares. �He is already showing a small profit.